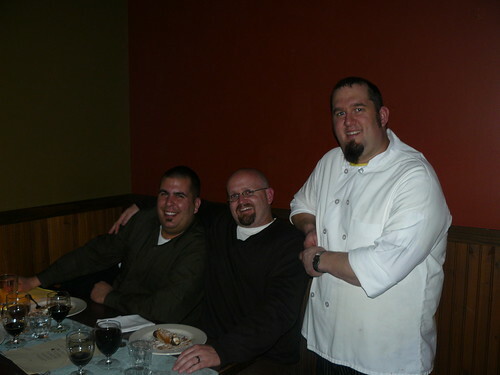 Chef Erik Wood on the right, with Port/Lost Abbey's Tomme Arthur in the middle, and Neil from Click Distribution on the left. I have been frequenting the Collins Pub for quite a while now, and it is one of my favorite places to grab a beer in town. One thing that has noticeably changed over the four years I’ve been going there is the food. It was pretty good when I started going there, but over the past couple of years it has become fantastic. That is in large part due to the addition of Head Chef Erik Wood about two years ago. Erik has been handling the menus at both the Collins Pub and the more recently opened Hudson Public House just off Lake City Way. Unfortunately, as of last week Erik will no longer be working with the two restaurants. In addition to creating every-day seasonal menus, Erik was well-known for putting together world-class beer dinners at Collins Pub. I have had the pleasure of attending several multi-course dinners with Erik in charge, and I can easily say that these dinners have provided some of my fondest culinary memories (here are a couple of reports from his beer dinners: Port Brewing/Lost Abbey and Hair of the Dog). If anyone reading is aware of any opportunities suitable for a beer-loving chef, such as Erik, please send him an email. I have no doubt that he’ll find a good position with his experience, but I would love to see him end up somewhere that will allow him to continue exploring the world of beer and food pairings. What did you learn about cooking with beer at Collins Pub? There was so much that I learned about beer from working at Collins Pub, it’s hard to pinpoint one thing that was the biggest. I really had no experience with beer before working there, but, when I got my hands into it, beer became so much more rewarding than wine. It just felt right… One of the biggest things that I learned was about sour beers and the differences between the different styles of sours. Flemish beers are great for cooking with and brett beers I would use as a marinade. Wild yeast sours one must use individually; there is no broad sweeping use for them because of the many different things that could result from there creation. I love to braise with beer! Dark beers are the best, but, strong ales can offer up a few intriguing results. You haven’t seen god on a plate until you have Abyss braised corned beef or Gulden Draak chocolate cake! What’s one of your favorite pairings you have created for a beer dinner? In terms of pairings, I hate to toot my own horn, but, there are SOOOO many to choose from. HA! Seriously though, I loved the roasted goat pouch with the Russian Imperial stout from the Stone Beer dinner in April ’08. I love goat though.. Others that I thought were great were the Venison Sausage and braised endive with Devotion from Lost Abbey and the Boudin Noir with apples and grains of paradise with Fred from the Hair of the Dog dinner. Those three were great. I’m sure that there are others that I am forgetting from the Ninkasi and 2nd Stone dinner, I still have to get to Collins and get all of my digital files off the computer. What would be your ideal job at this point in your career? My ideal job right now, other than opening my own place, is an Executive chef / Head chef job. I would want to have an extremely honest relationship with the owner or GM. I want to be able to be myself from the get-go without stepping on anyones toes because that’s not how they would do it. I want to have a good rapport so that they trust that I will get positive results. I want to receive as much constructive criticism as possible with solutions offered to problems that have arisen. Obviously beer-centric, preferably dinner only but lunch would be okay, as long as it’s not the focus. The concept would be, here comes the buzzwords, “New American” with “rustic pub food” and “gastro pub” influences. Seasonal menu changes, at least, with local produce and livestock whenever possible. I do have a lot of connections and people/purveyors I have worked with in the past. Perfection would be accomplished with an owner that’s not afraid of and actually enjoys offal, (brains, sweetbreads, liver, etc.) One of the most satisfying things that came from Collins was when we served Haggis. I went to eastern Washington with a cook of mine at the time and we killed a Mangalitsa Sow, butchered it ourselves and took all of the usable innards home with the pig. When we got it back, we made fresh Haggis, but, we sold it on 1st Thursday as “Pork” Meatloaf. It didn’t sell, initially. Then we just ran a special of Haggis and it actually sold. We even received an email from a woman who was in Seattle on Vacation and raved about it and couldn’t believe that we even had it on our menu. I take a lot of pride in what I do. Everything that leaves the Kitchen is an extension of me. I put everything into my cooking, and I feel it shows. That’s how you stand out in this business. I also like to make sure that everyone around me is learning something at all times. It doesn’t have to be something huge, but, I believe that everyone should be better for working somewhere. I feel that dishwashers should be able to become pantry cooks, line cooks become lead cooks, leads to sous, etc. If you’re not learning, what are you doing working in this profession? I have enjoyed Erik’s work at both locations. I have also enjoyed some very interesting homebrewing conversations with Erik. I wish I had my brewpub plans a bit further developed. I’d hire him in a second! He’s very imaginative and consistent from what I’ve seen. Erik has an incredible imagination. Anything with pork is amazing. I will greatly miss that food, I hope that Collins has not taken a turn for the worse. Good luck Erik, I hope you find something you truly love. Remember this town always loves an entrepreneur – and there are plenty of open spaces for rent! I personally think the pub will be better off without him. Addam was by far the greatest Chef that place ever had, and the menu went downhill as soon as he left. Erik had a lot of imagination, and creativity, but it always fell short with strange combinations that never sat on the tongue quite right. Not to mention, he completely ruined what was the best burger in town. Hopefully the next chef will bring things back to the way they should be. Wow – I’ll have to completely disagree, Nicole. The rest of your comments aside, how can you possibly say he ruined what was the best burger in town? What changed? I love the burger as it is now; it’s easily one of my favorites in town. I don’t recall what it was three years ago when I didn’t frequent the bar much. That’s too bad, I love the food at Collin’s. Hopefully they find a replacement that can keep it up! Man, this is terribly sad news! I never tried the food at Collins until the HotD beer dinner, and I was so blown away it’s now my favourite lunch place in town. The two Stone dinners and the Lost Abbey / Port dinner were also just amazing. Best of luck to you, Erik, and for chrissake, let us know where you end up!